Tank on Tank: Digital Edition is Lock ‘n Load Publishing’s computer adaptation of designer Peter Bogdasarian’s Tank on Tank board games covering the East and Western Fronts of World War II. The Digital Edition offers a combined version of both games though each theater can be purchased separately. 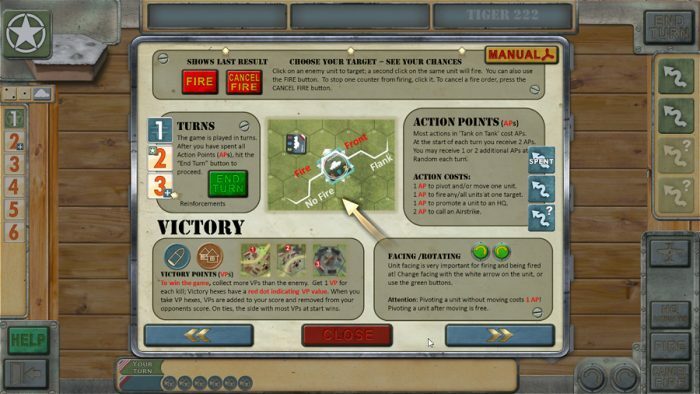 Tank on Tank, as described in the game manual, is “a low-complexity, Second War World War armored combat game.” The statement accurately captures the nature and flavor of both the tabletop game and the Digital Edition. The game offers a simple, clean interface. On the start screen, there is an option to “Fight!” This jumps you into a randomly generated quick battle if you don’t want to fiddle with choosing a scenario or campaign. The other game options deal mainly with the volume sound settings. There are no difficulty settings or anything else along those lines to fuss with. As far as I could tell, the “Arch Height” slider is only for adjusting a visual effect with no impact on game play. The play options are for solo or online play. Though my games were all solo, you can try to join a public online game or setup a private game with a buddy. The manual outlines the steps for online play and it seemed straightforward enough. The scope of the game is purely tactical. You’re given command of a variety of armored vehicles, infantry, artillery, and, occasionally, aircraft. The scale is somewhat amorphous. You’re pushing “units”. Whether those units are individual vehicles, platoons, companies, etc. doesn’t much matter for game purposes. 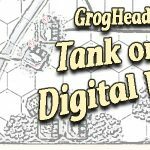 Tank on Tank: Digital comes with 19 scenarios for each of the two fronts. The West Front module includes 4 campaigns, while the East Front module has three. The campaigns are a series of linked scenarios. Victory in a campaign scenario rewards you with a bonus in the form of additional tanks. A loss means the enemy will be stronger in the next scenario. Two consecutive scenario losses result in losing the campaign, so does losing the final scenario of the campaign. Selecting a scenario in the menu yields a small image of the scenario map and check boxes for the sides. The recommended side is already checked, but you can override it and play whichever side suits you. For my games, I kept with the recommended side. ToT Digital very much goes for the look and feel of the board game it is based upon (and for which the author still owes us a review! – GrogLord). 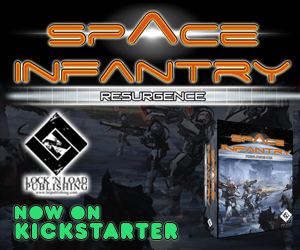 The combat units are counters with a silhouette and numeric values for range, defense, and movement. The hex map is laid on top of a “table”. Combat resolution is accomplished by “rolling” digital dice. Combined with some quirky audio effects, the game has an accessible charm (though I’m always a little sceptical of letting a computer roll my dice). Though not a high complexity game, Tank on Tank has a few key mechanics to learn and utilize. The PDF manual walks you through them and there is an in-game Help Guide that covers most the game’s features. I found the Help Guide easier to read/use than the PDF manual, but the manual does fine for learning the rules and at only 14 pages it is a quick read. Perhaps the most important game mechanic are Action Points (APs). 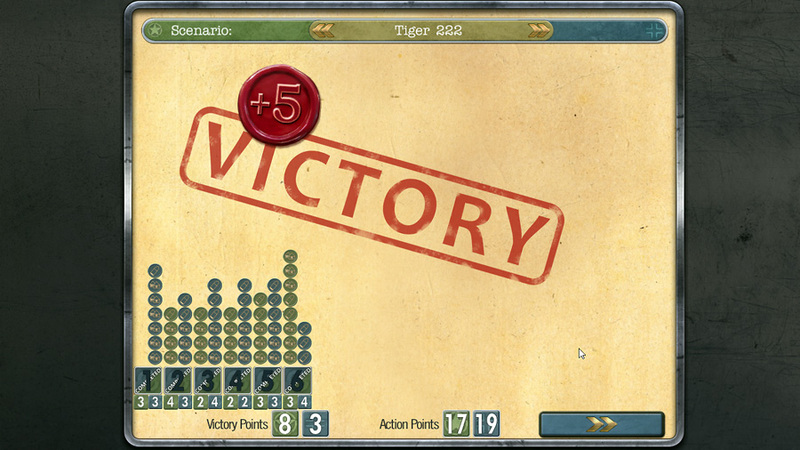 Each turn you have a variable number of points for carrying out a variety of actions with your units. You are assured 2 action points per game turn. Beyond those two, the game randomly awards additional APs up to a max of four. The catch is the additional APs are only revealed when you reach the point they are available. If you have a third action point, you will not know it until you’ve expended the first two. The variable AP system forces you to plan carefully for both your turn and your opponent’s. Having units caught in exposed positions when your opponent ends up with 4 APs can be painful, if not outright disastrous. Headquarters are another key game component. Certain units are designated as headquarters. Normally activating a single unit costs 1 Action Point. HQs allow adjacent units to activate freely. Effective use of HQs allows you to extend your activations. ToT utilizes a number of other fairly standard wargame mechanics- terrain modifiers, a road movement bonus, flank attacks, etc. The rules cover them all and they will seem common place to the average wargamer. There are airstrikes in the game. I was only the victim of them, though you can spend APs to call an airstrike if allowed by the scenario. They come in from off-board and the game does give you a nifty airplane graphic striking the target. It’s a nice bit of chrome even when it is one of your precious units being bombed into oblivion. 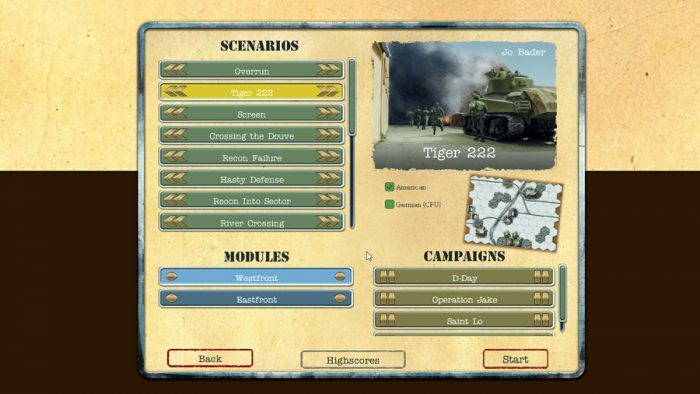 For my first game, I choose the West Front scenario “Tiger 222”. Playing as the Americans, I was commanding a mix of infantry, 2 Sherman tank units, and 1 Pershing unit going against a German PzIV and Tiger I with a Puma arriving as a Turn 2 reinforcement. 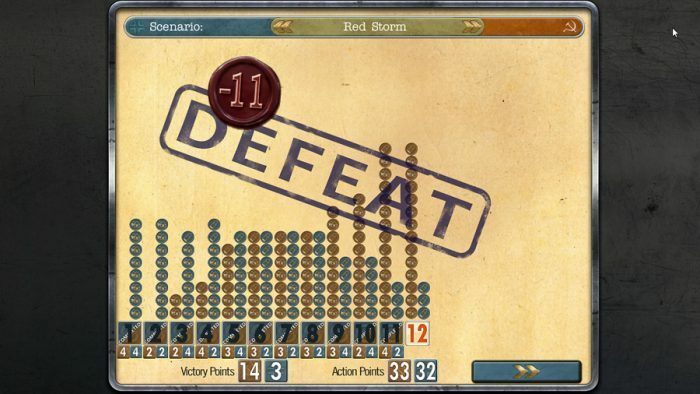 The scenario length was 6 turns. Using my HQs to move adjacent units for free and making use of terrain cover as best I could, I quickly overwhelmed the MkIV and soon after dispatched the rest of Jerry’s units. The AI was aggressive, but didn’t seem particularly dangerous. I ended up with a +5 point Victory. The whole thing was less than 20 minutes. Short and sweet, and I was feeling pretty good about the win. The feeling changed with the second scenario, “Red Storm”. This was an East Front scenario. I commanded the Germans this time, squaring off against the Soviets. 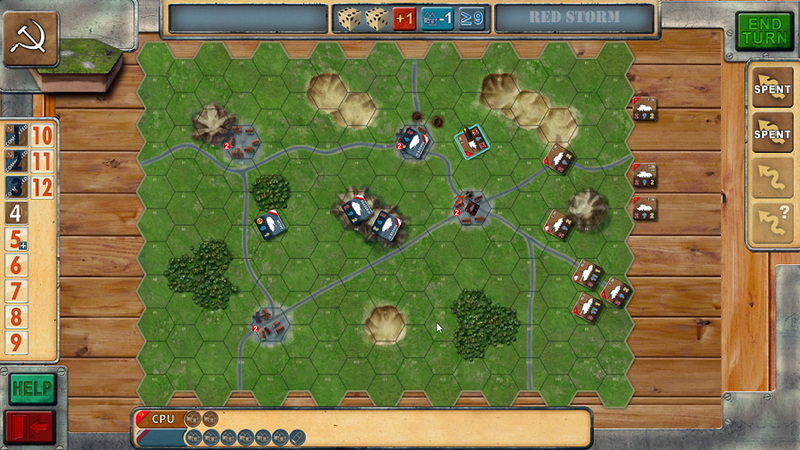 Everything about the scenario was bigger – more units, a larger map, twelve turns. I played Red Storm multiple times. The best I managed was a -3pt Defeat (a significant improvement over the -11pt Defeat I suffered in the very first play). The AI was aggressive and competent. It also did things differently each play through. As a lighter style game, it’s easy to underestimate the AI in Tank on Tank. It will, and does, punish sloppy or careless play. After licking my wounds and contemplating my losses in the Red Storm scenario, I dabbled in the campaigns. I didn’t finish an entire campaign, mainly because I lost too many scenarios. A campaign element is a welcome part of any game, but I had as much fun playing the standalone scenarios and quick battles. I found some of the controls to be a little wonky. Several times I inadvertently moved or changed the facing of a unit I had no intention of activating, costing me a precious action point. Overall though, I found the UI easy to use with information presented in a clear manner. I enjoyed the board game-style presentation. The sound effects were underwhelming. I turned the music of within five minutes of playing my first game. One of the vehicle sound effects sounded like a two-stroke lawnmower engine. Again, I was not overly troubled by any of it. Tank on Tank isn’t trying to pass itself off as a high fidelity simulation. Though I did not explore it, ToT does come with a Scenario Development tool that allows players to create Modules, Scenarios and Campaigns. Some would consider this type of game as “lite” or “beer and pretzels”. I think of it as a “bread and butter” game. 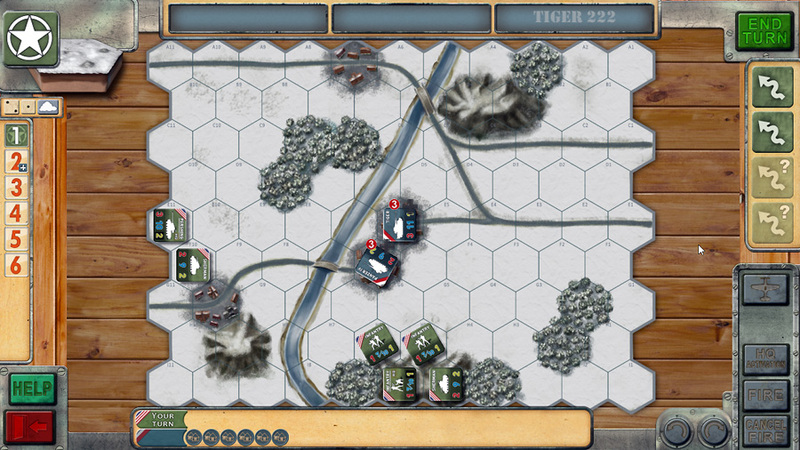 It offers a straightforward wargaming experience with some fundamental concepts that any wargamer will find familiar. Tank on Tank: Digital is also an extremely accessible game. With a quick read of the rules, you can jump right in and be playing games to completion in 15-30 minutes. 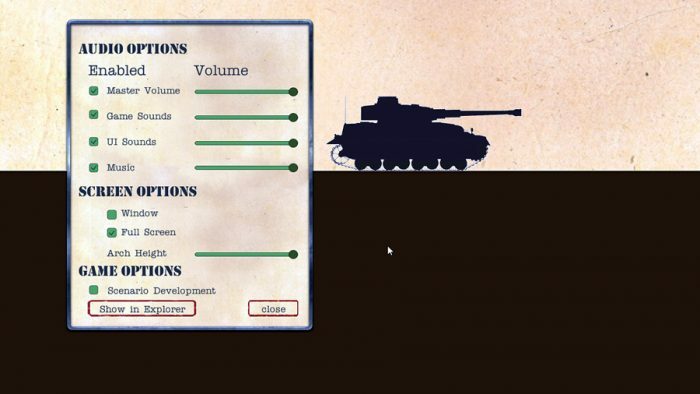 Tank on Tank: Digital is available for PC or Mac OS. The bundle version containing both the East and West Front modules is $39.99. The individual modules can be purchased for $24.99 each.